Offering chiropractic, physiotherapy and massage therapy to help with auto, workplace and sport injuries, we invite you to learn more about our premier practice and team. Tilbury Rehab physiotherapist Kim Ambrose, RPT uses a one-on-one treatment approach to help strengthen muscles & joints, and to help improve flexibility & coordination following an injury or accident. 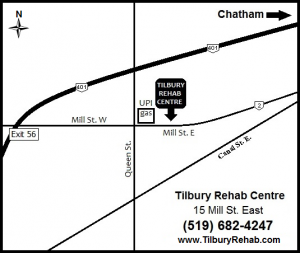 Tilbury Rehab chiropractor Dr. Mark Dubreuil, DC treats a variety of musculoskeletal conditions such as neck & back pain, whiplash, sciatica and other common disorders. Tilbury Rehab Massage Therapist Kristie Bannister offers professional Massage Therapy to help relax tense muscles and to promote healing by allowing improved blood flow to injured tissues. Tilbury Rehab physiotherapist Kim Ambrose is now on staff. Dr. Mark Dubreuil is here 6 days a week to take care of your chiropractic needs. Wondering how to get here? Tilbury Rehab Centre | Powered by Mantra & WordPress.